To do our part in supporting the cause of men's health, I have created a Movember team for our fair city, dubbed Durham: City of Moustache. Anyone is welcome to join the team and help raise funds. If you'd rather not participate in the challenge, donations made to the team will go to both the Prostate Cancer Fund and LIVESTRONG. As I'm already sporting a respectable 'stach, my first pledge toward the cause is that I will be shaving it off come November the first, and starting from a blank canvas. 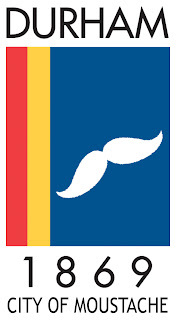 I'd also like to tip my hat to Greg from Freezerburns, who as the captain of the venerable Team RDU will be holding a Movember-thon on Nov 5th.